Grand Canyon, Arizona—Last week I wrote about the crash of a sight-seeing helicopter over the Grand Canyon in which three people died. Unfortunately, a fourth person has died of injuries he received in that accident. Jonathan Neil Udall, age 31, succumbed to his injuries Tuesday. The three surviving occupants of the plane remain in critical condition at University Medical Center of Southern Nevada. Mr. Udall was part of a group of six friends from England. He and his wife, Ellie Milward, age 29, were married less than three months ago in November. She remains in critical condition. The three couples were celebrating one member’s 30th birthday. Those who perished in the crash were Becky Dobson, age 27, who had just become engaged to Stuart Hill, age 30, and Stuart’s brother, Jason Hill, age 32. 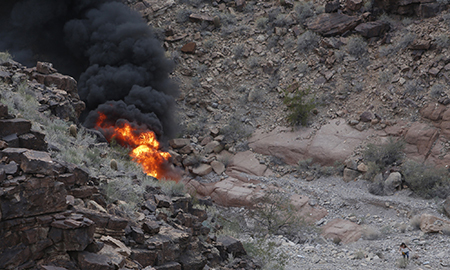 Survivors include Ms. Milward, pilot Scott Booth, age 42, and Jennifer Barnham, age 39. We express our condolences for those who died in this tragic accident and we wish full recoveries for those who remain hospitalized.